It is an old stone house, renovated and enabled. It is alone, at the end of the neighborhood of La Parte in the town of Las Hormazas, about 40 km from Burgos. 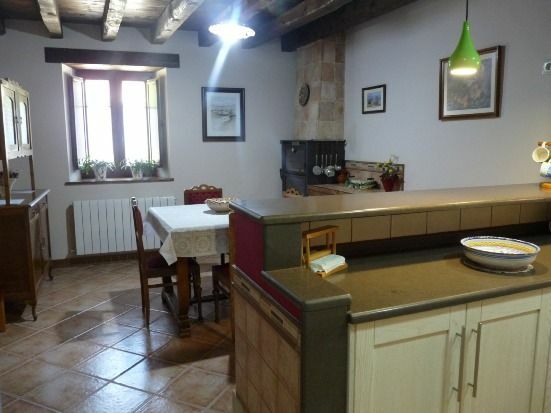 It consists of two floors of about 80 m2 and an attic with sloping ceilings. • A kitchen with all the necessary appliances and an adjoining dining room, separated by an American bar and with a wood oven. • A very cozy living room with fireplace. In the attic there is a seating area. The house has adjustable heating. It also has board games and numerous children's toys. All of it is decorated with rustic style and many of its furniture are old. The house is outside the circulation of cars or agricultural vehicles. It has beautiful views of the village hermitage, which is located on top of a mountain. If you are looking for a quiet area, a cozy house, rustic but with all the amenities to make the stay perfect, you will surely find it in Fuente Culabrás. A living room that invites to the gathering in the heat of the fireplace, a practical kitchen where you will not miss anything, rooms with old flavor and where time stops. Your children will have the security of a zone free of vehicles and with provision of games and toys for any age. The name refers to the spring from which comes the water that runs through the stream attached to the house and that currently supplies the neighborhood. La casa due perfecta. Estuvimos un fin de semana largo allí, dos parejas con cuatro niños. Ellos se lo pasaron fenomenal; había un montón de juguetes en la casa, con lo que no es necesario llevar nada; el pueblo es pequeño, no pasan coches, con lo que no hay peligro de que corran por la calle. La casa tiene de todo tanto en la cocina como en las habitaciones y los baños, nuevisima. Decorada con gusto. La verdad es que nos encantó. Espero que podamos repetir otra vez. El precio nos pareció muy bien también. Gracias, Lola. Estuvimos un grupo de amigos con hijos desde el 27 al 31 de Marzo. La casa es muy acogedora y funcional. Tiene un montón de juegos para niños así como un gran equipamiento.La relación calidad precio es muy buena.